For The Jazz Session’s 300th episode, a rare chance to sit down with four musical veterans: David S. Ware, William Parker, Cooper-Moore and Muhammad Ali. 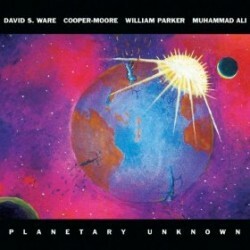 The four have just released Planetary Unknown (Aum Fidelity, 2011). This interview was recorded in the dressing room just after their performance at the 2011 Vision Festival. In this interview, they talk about the spiritual side of music; give advice to young musicians; and tell stories from their 100+ years as performers. Learn more at Aum Fidelity’s Planetary Unknown page. NOTE: Today (August 11, 2011) is the final day of the “100 By 300” membership campaign and I haven’t quite reached my goal. Please support the show by joining today for as little as $10 a month. Tracks used in this episode: Passage Wudang; Shift; Duality Is One; Divination; Crystal Palace; Ancestry Supramental. Next PostNext THANK YOU ALL SO MUCH!